When most people hear the term ultra-low-cost carrier, the first thing they do is cringe. The second thing they do is probably think about an airline like Ryanair. Ryanair is an Irish airline headquartered in Dublin, and they have long been a low-cost carrier that people love to complain about. Sometimes it’s the extra fees for everything from water to their baggage fees to seat assignments that brings out the anger. Other times it’s the operational inconsistencies that have led them to delay and cancel hundreds and hundreds of flights over the past couple of years. Either way, you can consistently find social media littered with disparaging comments about Ryanair. Unfortunately, much of that anger is caused by a lack of understanding. Many of those customers just didn’t know what they were getting into when they booked a Ryanair flight. Here, we’ll take a look at the boarding process that Ryanair uses for their flights — so when it comes time for you to fly, you won’t have any surprises when you get to the gate. Knowing what to expect with boarding, fees, and delays will help you to remain calm if something goes wrong. Not only will your travel day be less stressful, but you can help improve the day of everyone around you too. Ryanair uses one of the most basic boarding procedures of any airline in the world. There are just 2 groups: priority boarding and general boarding. Sounds simple, right? Well, although the 2-group process is simple in nature, it’s very important that you know how boarding works…or you’ll find yourself at the end of a very long line and checking your carry-on bag. Ryanair does things very differently from the airlines that you normally fly, and it helps to be prepared so you aren’t caught off guard (like a certain UpgradedPoints writer was on his first Ryanair flight). Let’s just say I now know the ropes! Hot Tip: When flying with Ryanair, knowing which boarding group you’re in isn’t as important as the timing they use for boarding — but let’s start with the 2 groups so you can understand how to choose which one you want to be in. As we said before, there is nothing to decode and no guessing when it comes to the Ryanair boarding groups. Priority boarding is just that: passengers who have purchased priority boarding are able to board with this group. There is no way to earn priority boarding other than by purchasing it. Each of these packages includes other items as well, and pricing varies by both package contents and the length of the flight. General boarding, again, has no surprises. Bottom Line: There is no extra cost for general boarding, so passengers who are trying to save money will be in this group. This group will contain the majority of passengers for most Ryanair flights. We are going to touch briefly on the topic of Cabin Bags here because it’s not only an area of confusion when flying with Ryanair, but also because it’s tied pretty directly to priority boarding. For a basic ticket, you are now only allowed to bring 1 personal item (cabin bag) onboard, and it must fit in the space under the seat ahead of you. For the packages we mentioned above that include priority boarding, only the Plus package doesn’t also include a second cabin bag. Priority + 2 Cabin Bags obviously does. Both the Flexi Plus package and the Family Plus package include Priority + 2 Cabin Bags as a part of their packages. Expect long lines — really long lines. With only 2 boarding groups (and thus 2 boarding lines), these lines can get extremely long well before boarding is scheduled to begin. If you walk up to the gate right at the boarding time (whether you have priority boarding or not), you will be at the end of a very long line. When flying with Ryanair, it is best to get to the gate and be prepared to wait in line well before your flight time. Hot Tip: Although the boarding lines can be long, Ryanair boards their flights quite quickly, and they have a goal of closing the boarding gate 20 minutes before departure. If you’re used to cutting it close with the doors closing at 10 minutes like on many other carriers, you need to be careful not to miss your flight on Ryanair! At certain smaller airports (currently 15+), Ryanair boards their flights via bus rather than the jet bridge, which can cause a bit of a mess for the boarding groups. If you are first in line for priority boarding, you will be first onto the bus — but unless you position yourself strategically, you will be one of the last people off of the bus and onto the plane. Similarly, if you are toward the end of the priority boarding line, your bus might have some passengers from general boarding on it. Those passengers may end up getting onto the plane before you, even though you paid to board in the first group. Ryanair has always limited the number of larger cabin bags on each flight to 90 bags, because they know that 90 bags will fit in the overhead bins. Gate agents will count as people board, and after 90 bags go by, everyone else will have to gate check their larger bags. Now that they require the purchase of a second cabin bag, theoretically your second bag is guaranteed to go on the plane with you. In practice, this probably works out most of the time, since Ryanair usually won’t have more than 90 passengers purchasing the second cabin bag for a single flight. In an odd case where they do though, we have to assume they’ll gate check the remaining bags even though passengers paid to take them on board. Avoiding this scenario is another great reason to get in line early. Bottom Line: Unless you’re really on a tight budget, it makes sense to buy one of the packages that include priority boarding. In addition to getting into the priority boarding group, the Priority +2 Cabin Bags package is one of the only ways you can take a full-size carry-on bag onto the plane. That package starts at just 6 GBP for a one-way flight — that’s not very much to pay for a few perks on your flight (including not having to check a bag). 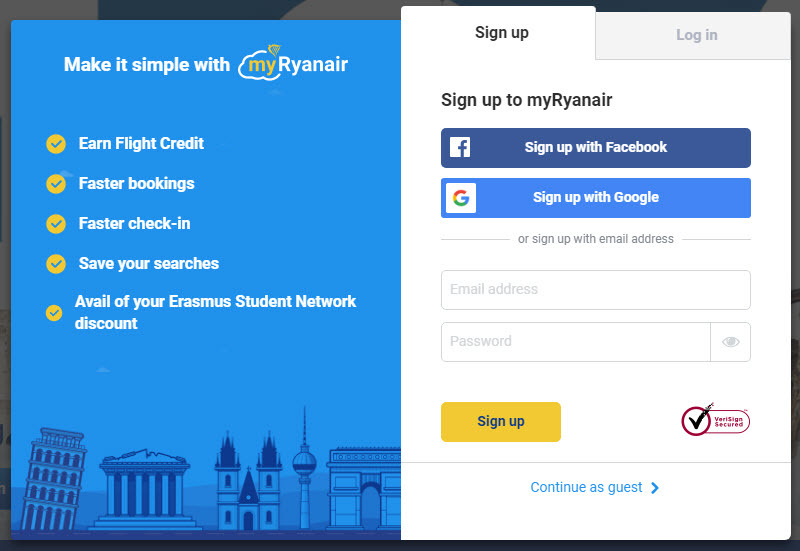 Although you won’t be earning valuable miles or points you can use for free flights, the myRyanair loyalty program does have a few features worth signing up for. Image courtesy of Ryanair.com. In most of our other boarding process pieces, we have gone over the best ways to earn points in each airline’s loyalty program. We can’t really do that for Ryanair — although they do have a loyalty program, they do not use points or miles, and it’s nothing like the traditional loyalty programs you’re familiar with. Instead, we’ll look at the details of the myRyanair program and see what benefits it may have for you. It’s free to join, and you can often get a flight discount coupon of around 10-15 Euros when you sign up…so why not add it to your list of airline loyalty programs? The benefits of the myRyanair program can be seen in the image above. Obviously, the biggest benefit would be the potential to earn flight credits. Unfortunately, Ryanair doesn’t provide exact details of how to earn rewards in the myRyanair program. Instead, they say that they will tailor rewards to each individual member. We don’t have any secrets about how to earn larger denomination flight credits — most likely, the more you fly with them and the more you spend on ancillary fees, the faster you’ll earn rewards. Bottom Line: It is important to remember that the 10-Euro bonus you get for signing up (or the 15-Euro flight credit earned from the myRyanair program) isn’t as small as it seems. When flight prices are regularly under 50 Euros one-way, even a small discount is a good portion of your flight cost. 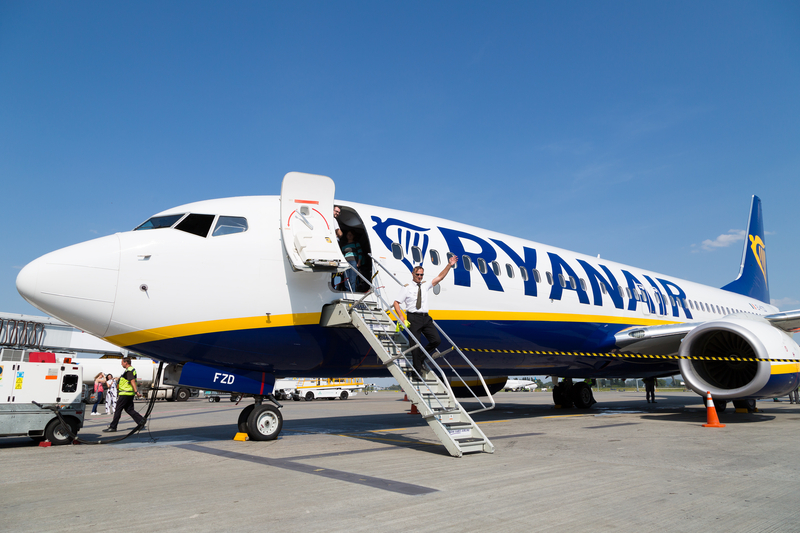 Ryanair has over 400 planes and flies to more than 220 different destinations. Both by total passengers carried and the number of international passengers, Ryanair is the largest airline in Europe. If you want to travel by air and you’re looking for the least expensive way to get around Europe, chances are you’ll find yourself on a Ryanair flight in the near future. Contrary to what you may think, that isn’t necessarily a bad thing. With sub-$30 fares between London and several continental European cities, when it comes to price, Ryanair is really hard to beat. We can’t help you with delays or cancellations, and we can’t help if you need to purchase a snack onboard — but we can help lower the stress at the boarding gate. By knowing the boarding procedures and what you will pay in fees, you’ll be fully prepared for your flight and able to happily move on to your next destination. The more you travel, the more you will find yourself on ultra-low-cost carriers around the world. Ryanair is just another of these carriers. Will it be as comfortable as a mainline carrier like British Airways or Lufthansa? Probably not — but maybe we should take a minute to appreciate that for less than what it costs to check a bag on a domestic U.S. flight, Ryanair will get you from one country to another safely in under 45 minutes. If that’s not a great value, we don’t know what is. How many boarding groups are that on Ryanair? Ryanair uses just 2 boarding groups to load their planes. Priority boarding is available for those passengers who have purchased it, and the rest of the passengers will be in the general boarding group. Are Ryanair flights assigned seating? Yes, Ryanair uses assigned seating for all of their flights. Passengers can purchase a seat assignment if they want to choose their own seats. Passengers who do not choose to purchase seat assignments will each be assigned a seat when they check in for their flights. Groups traveling together are not guaranteed to be seated together unless they pay to select seats in advance. Who has priority boarding on Ryanair? Priority boarding on Ryanair is only available to those passengers who purchase it either on its own or through a package. The Priority + 2 Cabin Bags, Plus, Flexi Plus, and Family Plus packages all include priority boarding. Who has general boarding on Ryanair? The general boarding group on Ryanair includes all of the remaining passengers who did not elect to purchase either priority boarding by itself or a package that includes priority boarding. General boarding will contain the majority of the passengers on a flight. When can families board with Ryanair? Ryanair does not have a special advanced time for family boarding. Families who purchase the Family Plus package will have priority boarding included. Families can also choose to purchase priority boarding in one of the other available packages. Will families be seated together on Ryanair? Ryanair requires that adults traveling with children between the ages of 2 and 12 pay for assigned seats for the adults. Up to 4 assigned seats for children will be available free of charge with each paid adult seat. Useful and informative article. It is always worth reading the airline `s bag policy before flying!